In 2010 I joined the Lower Manhattan Cultural Council to curate Sitelines, the organization’s site-specific performance series as part of The River to River Festival and to serve as Director of Public Programs where he worked with neighborhood stakeholders such as American Express, Goldman Sachs, Brookfield Properties, CBRE, The Port Authority of New York/New Jersey, the Alliance for Downtown New York and the New York City Economic Development Corporation to develop and implement cultural strategies for the continued revitalization of Lower Manhattan. 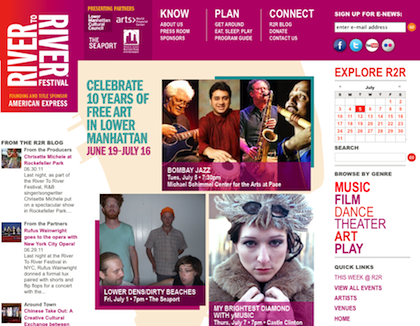 After the 2010 festival, LMCC assumed leadership of River To River from the Alliance for Downtown New York, and I became curator and producer, tasked with re-imagining the free, summer-long season. While maintaining the festival’s commitment to free, outdoor public programs, I diversified presentations to include site-based contemporary performance, new music, interactive games, digital experiences, literary and humanities programs that doubled attendance and raised the overall quality of the festival. To get a sense of the program, please refer to this User’s Guide to the 2012 River to River Festival. Artists presented and/or commissioned include: Laurie Anderson, Bang On A Can, Philip Glass Ensemble, Stephen Petronio Company, Trisha Brown Dance Company, Patti Smith, SO Percussion, Sam Green, Tere O’Connor, John Ashbery, Alarm Will Sound, George Clinton & Parliament Funkadelic, Richard Maxwell/NYC Players, Vijay Iyer, Nico Muhly, Shara Worden, Chrisette Michelle, Brooklyn Rider, JG Thirlwell and STREB.